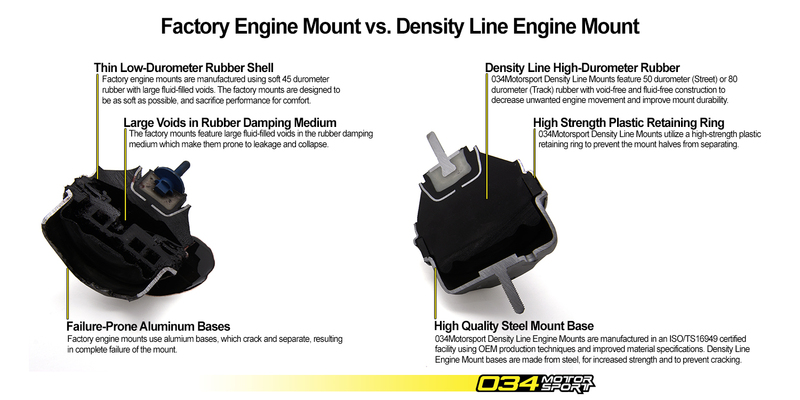 The Street Density Engine Mount Pair is manufactured from 50 durometer rubber, which is approximately 10% stiffer than stock. Since the mounts are also void-free and solid-filled, the resulting mount is approximately 25% stiffer than stock. The mount bases are made from steel, and are much stronger than the factory aluminum ones, to cope with the added stress of spirited driving. The Track Density Engine Mount Pair is manufactured from 80 durometer rubber, which is approximately 90% stiffer than stock. Since the mounts are also void-free and solid-filled, the resulting mount is approximately 120% stiffer than stock. The mount bases are made from steel, and are much stronger than the factory aluminum ones, to cope with the added stress of spirited driving. 2.0T FSI / 3.2L FSI - Please Note: Tiptronic vehicles with active mounts require two of our Resistor Bypasses to prevent the MIL from illuminating. Please select Street Density or Track Density from the dropdown menu below. Sold individually. One vehicle will require 2 mounts!